Quick and easy instructions for creating S-T-R-E-T-C-H-Y ruffles. TWO easy, fool-proof methods for sewing ruffles: using clear elastic or single baste ruffles. This is how I add stretchy ruffles to tight fitted knit garments ... like the legs on leggings, arms on t-shirts or the tops of socks. You can use ribbon, knit or woven fabric strips or even lace. Add some buttons or bows and you can make them even more awesome. 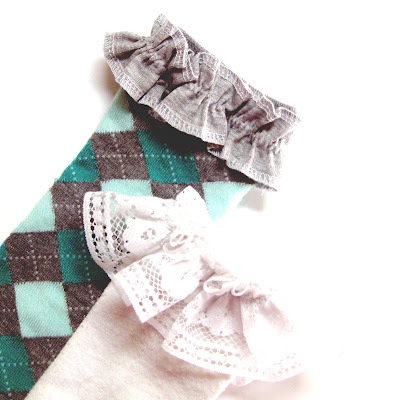 Check out my other tutorial on making little girl knee high socks HERE.